Invoices—the word doesn’t incite much excitement. It’s usually an admin task you dread, even if you’re the one who will be raking in the cash. However, invoicing is a critical part of the cash flow system that every company needs. If your invoices (ahem, cash flow) just sit there, the company will quickly deflate. Nobody will get paid, which means nobody will work and bankruptcy will be right around the corner. Most businesses would love to get paid immediately for services and products, but that’s just not realistic for 100 percent of companies 100 percent of the time. Thus, invoicing was created. Still, every business owner and manager knows that sometimes invoices don’t get paid. At times it’s because the client is shady and/or broke, but sometimes it’s the invoicing process itself that’s to blame. That’s why I created Due.com, the company that streamlines invoicing to make it a quick and easy process for everybody involved. At Due, we recently conducted a survey to see what makes invoices get paid or get ignored. I shared the highlights with Intuit QuickBooks, and you can check out the findings to see how you can up your invoicing game! First, the logistics. We studied a whopping 250,000 invoices to dig into the science behind them. On average, 18 percent of invoices get paid within 24 hours of delivery (a big thank you to all those clients who are so on top of it!). The average invoice amount is $365, which complements that quick turnaround. Most companies have that kind of cash in the bank. The majority, 63 percent of invoices, get paid “on time,” which is usually 30 days. Suddenly those figures don’t look quite as promising. Sadly, 16 percent of invoices never get paid. That’s 16 percent of your deserved, expected profits that go AWOL each year. However, of those 250,000 invoices, it was clear that there were some big quality differences between them. If you put a logo on your invoice (it doesn’t need to be fancy), you have a 300 percent higher chance of that invoice getting paid. If you have a due date on the invoice, you’re eight times more likely to get paid. Obviously, right? However, 25 percent of invoices don’t include a due date. Putting payment terms on your invoice increases the odds of getting paid 1.5 times over. These are all seemingly basic, easy things that you can slap on your invoice in less than ten seconds. It’s the best ROI your business has at the ready, it’s free, and yet so many people aren’t doing it. Another faux pas? Sending the invoice to too many people. Every time you add another recipient to the invoice list, fewer people take ownership. After all, it’s Bob-in-accounting’s job to pay this, not Susan the outsourced bookkeeper, right? Luckily, there are some easy tricks you can utilize to increase your odds of getting paid even more. For starters, always get a contract with your clients before you begin. Too late for that? You can always ask to get a contract in place now—just make sure you highlight the fact that it will benefit all involved. Offer a discount (two percent is solid) to lure clients into paying early. You can offer this to all clients, or just those who “struggle” to pay on time. Two percent for a ten day invoice turnaround is much better than letting 16 percent of all invoices go unpaid. Another option to get payments flowing? Get yourself a subscription service for an invoicing software that does a lot of the dirty work for you (again, Due.com is a great choice). This way you can manage recurring payments, rely on auto-fill, and overall it makes your business look a lot more professional (kind of like adding that logo). One simple “hack” is to make your invoices smaller. It might look fantastic to you to whip up a $5,000 invoice, but it’s daunting to clients! Break it down into reasonable, smaller invoices because it’s a lot easier to pay five $1,000 invoices than one big $5,000 one (or at least it seems that way to clients!). You don’t necessarily have to implement all of these tips, tricks, and hacks at once—and maybe they don’t all apply to you. However, with a 16 percent unpaid rate, you can’t afford to sit still. You provided the goods or services clients requested, and you deserve to get paid. It sounds pretty basic, but it’s clearly more challenging than that. You also need to blend these tactics with solid accounts receivable management, so make sure you look internally before putting all the blame on clients or invoices. Ultimately, you might not be able to avoid using a collections agency for those pesky clients who refuse to pay. Most clients mean well, and sometimes they’re too embarrassed to say they forgot, they’re broke, or their own company is on the verge of bankruptcy. The fight or flight instinct is strong, and you don’t want your clients (and their cash!) flying away from you. Keep in mind that your clients are often just like you: Entrepreneurs, small business owners, founders of startups, and overworked managers struggling to get everything done while keeping everybody happy. Sometimes life and business get overwhelming and you could use a little help or boost. 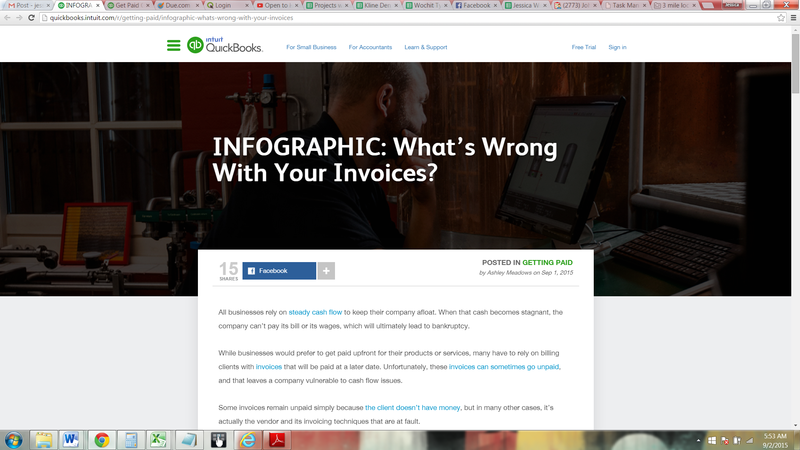 Try out Due.com for easy invoicing, and read the entire article on What’s Wrong with Your Invoices on QuickBooks now.